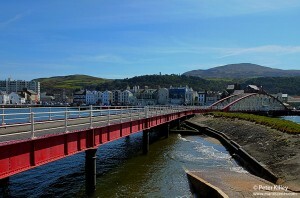 I caprtued this image today whilst in Ramsey, it generally depicts Ramsey’s Swing Bridge but if you look at the image you will see a few iconic landmarks from the North of the Isle of Man. To the left of the image you can see St Pauls apartments which are the highest apartments on the Island, next to it is the beautiful St Paul’s Church. In the centre of the image you can see Albert Tower which was erected to commemorate the visit to Ramsey of Prince Albert in September 1847, when he randomly walked up that hill on his visit to overview the town.